Kat, Myrna gave me this last month! I can’t believe you have it highlighted! She knows how organized I am and this shirt folder provides me with even MORE organization to supplement my existing s’kills! Plus, if I put them in the right order, I can just take them out, wear them, have my cleaneing lady wash and iron them, and then have her put my shirt’s ack in the organizer so that I can wear them again! I want to tell the HIVE that Myrna and I met some guy’s at the deli who were watching the football game. They were VERY mad, and I found out they had bet big on the Saint’s team, and lost at the last minute. We did NOT want to deal with them b/c they were NOT interested in us b/c they lost money. I would NEVER marry a guy who bet money on games. FOOEY on them! I do NOT know what the experence of the HIVE is with men they HAVE married that bet on games, but I think it is a BIG turnoff; almost as much as men who smoke cigarettes or cigars. I do NOT want those mouth’s anywhere near mine! DOUBEL FOOEY! I’m super into organizing and own half the container store, but this item has always seemed insane to me. 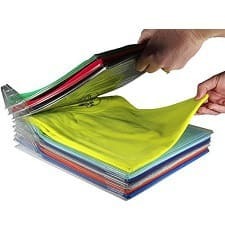 Ha, I was going to say something similar, that I am one of the more organized people I know and I can’t see using this. I wonder if you can fold a shirt and slide it back into place. Why would I want to re-stack every shirt each time I do laundry? Does anyone have a favorite pajamas that are very warm and snuggley for winter? Hoping I can find something good on sale today. I am looking for a 2-piece with jogger/legging type bottoms with elastic at the ankle so they don’t ride up under the covers. My current pair is wonderful fleece like this with a great big floppy cowl neck comfy top. But I can’t find another pair of these…. I need a warm snuggley robe too! Cuddl Duds! I could only find these right now so you’ll have to look around: https://www.kohls.com/product/prd-3056296/womens-cuddl-duds-pajamas-wake-up-call-top-jogger-pants-scarf-3-piece-pj-set.jsp?isClearance=true&prdPV=6. But I have several sets and basically live in them all winter. if only in my size….. sigh…. It’s a long winter in Chicago. How can all the warm pjs be sold out! Check out the PJ Salvage thermal options online at Nordstrom Rack. I bought when they were in the regular store. The fabric isn’t at all what I would typically think of as thermal (it’s not bumpy). It’s thick and super soft with stretch (unlike fleece or flannel). I don’t know how to describe it other than pure warm-y goodness. :) I bough two pair and have been living in them. (Don’t tell anyone, but days I’m working from home, I’m sometimes still living in them because it’s too comfy to change.) I’m kind of debating getting a third now given the discounted price. I bought a pair of the PJ Salvage pajamas at the Nordstrom sale too. Very cozy. I would describe them as fleece more than anything else. Thanks so much for adding this recommendation! I will look for them right away. Just ordered two, one for myself and one for my nephew. I am the least organized person I know, but I might actually use this. Thanks for the post! There is a limit to the number of sheath dresses I need, but making sense of my closet, now that is an endless topic. Off shoulder clothes never look right on me and I am struggling with how to make them work. The problem is that I feel like I can never pull off strapless bras. I am a 34C but I have still not found a strapless bra that gives me anywhere near adequate support. Maybe its also that I am short so lack of support means that it feels like my breasts are close to my belly! How do women deal with this? Are you sure you’re a 34C? Because most women are wearing bras that are too large in the band and too small in the cup. If your band size is too large, that would lead to a strapless bra not providing enough support. Can you go get measured at a specialty bra store or Nordstrom?